Our in-house chemical analysis laboratory monitors both cleaning and plating solutions to stringent standards. 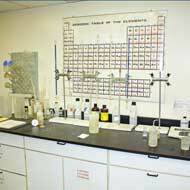 The laboratory also monitors trends that become apparent over time, leading to continuous improvements in bath chemistry. In short: better plating solutions produce better plated parts. 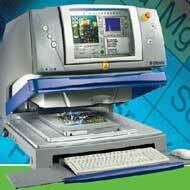 An inspection department equipped with the latest electronic and mechanical measuring and testing devices. Inspectors trained in the proper use of measuring and testing equipment. A Calibration Service which meets MIL-STD-45662. Raw materials and new equipment qualification programs. Records retention program for inspection data, certificates of compliance and process control documents. Production personnel trained in the careful handling of delicate, precision parts. Key plating personnel certified by the American Electroplaters Society. Inc.
We know that quality has to be built into our products, not inspected into them. Consequently, we question and refine our processes and controls every day. We are committed to partnering with our customers to provide the highest quality finishes time after time. Contact Hi-Tech Plating & The Tinning Company and see how our strict adherence to quality standards gives you the best product available. At Hi-Tech Plating & The Tinning Company, we use the X-Strata980 high-powered X-Ray Fluorescence Analyser from Oxford Instruments to accurately measure the thickness and true elemental content of the plated coatings that we produce. We verify the accuracy of our XRF equipment daily to thickness standards that are calibrated yearly to National Institute of Standards & Technology requirements. Your specifications are actually met - not just certified to. Our staff of highly trained and experienced Engineers and Operators possess over 200+ years of experience, enabling you, your company, and your customer to keep a competitive edge in design, development, and production. We're well-versed in specifications requirements and trained to interpret complex engineering drawings.